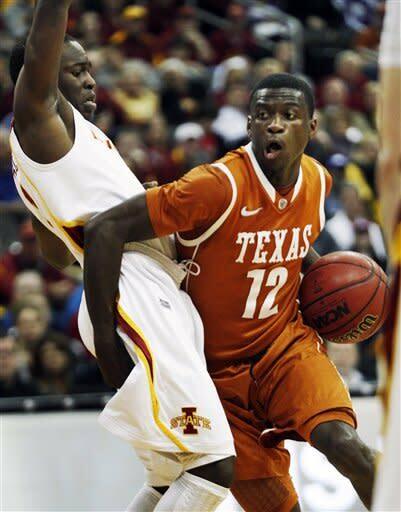 As the NCAA investigated Kabongo's amateur status over the past several months, Texas held Kabongo out of the lineup. The NCAA's investigation has centered around whether Kabongo, a one-time potential NBA first-round draft pick, received impermissible benefits from agent Rich Paul, who represents NBA superstar LeBron James and two former Texas Longhorns players: Cleveland Cavaliers forward Tristan Thompson and San Antonio Spurs guard Cory Joseph. In most impermissible benefits situations, players usually are suspended from three to 10 games and ordered to repay the amount of the benefits received. In this case, the penalty was made more severe because Kabongo provided inaccurate information to NCAA investigators when he was interviewed, sources with ties to Texas' basketball program said. The loss of Kabongo is a major blow to an inexperienced Texas team that already has been struggling without its best player. The Longhorns are 6-4, including a shocking loss to NAIA Chaminade in the Maui Invitational last month. Kabongo averaged 9.6 points and team highs of 5.2 assists and 1.3 steals last season. As Y! Sports reported previously, one element of the probe centered on whether Paul played a role in Kabongo traveling to Cleveland last spring on a trip that included at least one workout with New York-based professional trainer, Jerry Powell. At issue was who paid for Kabongo's travel and expenses, and whether Powell's training was provided without cost. Powell told Yahoo! Sports in October that an NCAA investigator contacted him about the probe into Paul and Kabongo. Powell said he worked out Kabongo in Cleveland in May, and that Paul wasn't in the gymnasium. "I told the NCAA my side of the story," Powell told Yahoo! Sports. "I'm sure Myck told his side. I'm not trying to ruin nobody's eligibility. It's never been about anything but workouts with me. I'm a trainer. That's all. I'm not aligned with anybody. I'm my own person. I don't get caught up with any of that." Powell told Yahoo! Sports that he had a previous relationship with Kabongo through "someone I know who [Kabongo] played a tournament with once." Powell did not disclose who that person is, why he had traveled to Cleveland or how the workout was arranged. "After [the workout] was over, I just went back to my hotel room," Powell said. "I'm not aligned with Rich. I did the workout. That's all I did." An agent is allowed to have a relationship with a prospect and his family, but providing or promising financial benefits could place the player's college eligibility in peril. If the NCAA uncovers violations, Kabongo's eligibility could be compromised. Kabongo and Thompson are childhood friends from Toronto who attended the same high schools in New Jersey and Nevada before ultimately going to the University of Texas. Thompson was a rookie with the Cavaliers during the 2011-12 NBA season while Kabongo was a freshman at Texas. Powell said Paul was present for a predraft workout of Michael Kidd-Glichrist in New York last spring, but not with Kabongo in Cleveland. Kidd-Gilchrist is a Creative Artists Agency client with whom Paul worked closely within the past year. After four years working in CAA's basketball division, Paul left the company in September and has applied with the National Basketball Players Association to be a registered player agent. At the same time, James left CAA and made Paul his agent. After Kabongo's freshman season at Texas, Paul called several NBA front-office executives on the player's behalf to gauge where Kabongo, a point guard, might be picked in the 2012 NBA draft, front-office sources told Yahoo! Sports. At CAA, Paul hadn't been registered as an agent, but was active in recruiting several players to the agency, including Thompson and former Syracuse guard Jonny Flynn; and he communicated with NBA front offices in several agent-related capacities, league sources said. Bylaw 12.3 of the NCAA rulebook covers agent interaction. "A student-athlete … may not agree verbally or in writing to be represented by an athlete agent in the present or in the future for the purpose of marketing the student-athlete's ability or reputation," the bylaw states. "If the student-athlete enters into such an agreement, the student-athlete is ineligible for intercollegiate competition. "Also, a student-athlete may not accept transportation or other benefits from an athlete agent. This prohibition applies to the student-athlete and his or her relatives or friends." Several NBA front-office officials believed Kabongo could have elevated himself into a mid-first round draft pick as a sophomore. As one Eastern Conference official said, "Maybe even a late lottery pick in what's going to be an average draft." But after what most considered an ordinary freshman season and becoming ineligible as a sophomore, Kabongo's chances to getting drafted in the first round are improbable.